We were invited to attend the screening as press. All opinions are always honest and solely our own. Can you keep a secret? 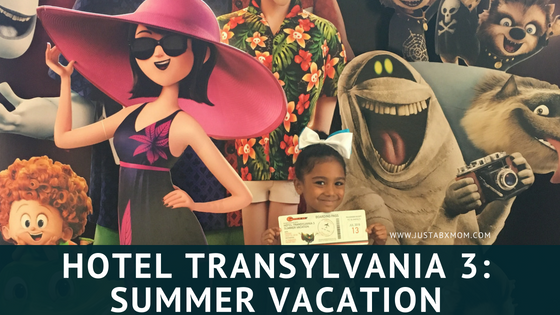 I’ve seen Hotel Transylvania 3: Summer Vacation twice! Please don’t tell JustaBXgirl. She thinks when we went to see it together it was my first time. And she thought that because she could see how much I enjoyed the film, even the second time around. I didn’t think I would enjoy this movie as much as I did. Part two had long been my favorite but this has taken over. I’m sure you already know that at the end of the day this is a love story for Drac. Yes, that is all sweet and very, very funny watching it come together but for me, this movie was much more than a love story. It was a message about family. It was a message about acceptance and a wonderful reminder that at the end of the day, humans, monsters, whatever, we’re all the same. Yup, I’m back to this franchise teaching us about acceptance. Remember when I first spoke about that. We are living in a world that is trying to separate us more and more daily. I’m here for anything reminding me that we all belong to each other. This movie does that to me. I love that this movie also shows that hate can be unlearned. Ericka Van Helsing had no intentions of being anything other than the one to fulfill her family’s LEGACY but fate had other plans. Along the way for her to get this epiphany, there are plenty of expected and some unexpected shenanigans from our favorite characters. Dennis and Winnie as always, are quite the team. I love that Tinkles from the Hotel Transylvania short was included and the short was not a standalone but part of the franchise as well. The whole crew is back together and it was fun to see them all reminding us that sometimes family is chosen. They really are #squadgoals. I loved watching the wolf family get a break when they discovered the Kids Club on the ship. And I felt bad for Frank when he had to tell Eunice that he lost his hands gambling after she warned him not to. Did you know that Blobby becomes a single dad in this movie? Yup, there is so much to love. Oh, the music! How can I not talk about how great the music is? One of my favorite scenes is when Drac and Blobby do their Saturday Night Fever strut across the ship’s deck. I’m telling you this movie is not just for our littles. There is much for us to love and lots to talk about after. In case you were wondering, one of JustaBXgirl’s favorite parts is when everyone is dancing The Macarena. It was the first time she saw the dance or heard the song and she was in giggles!